Leather Compendiums - Premium Corporate Gift Idea. Leather compendiums make great corporate gifts for clients. Corporate gifts can be tricky so make sure yours will impress client or customers. Promotional Product Experts branded leather compendiums are truly impressive business gifts. Made with premium quality leather, these custom leather compendiums exude elegance and are practical with features like pen loops, A4 pads for note taking, internal pockets for business cards and other important documents. 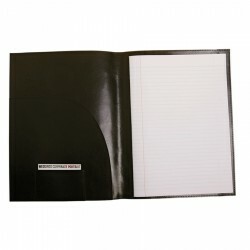 Bonded leather notepad cover designed to add executive appeal to your A4 notepad. 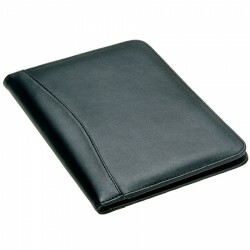 Features a buiness card holder, document sleeve and elastic closure. Pad not included. Made from soft Nappa leather with stylish silver stitching and unique pen closure. Features: Includes internal pocket and business card holder. Pen not included. Perfect for restaurants and cafes. Made from leather-look material, with metal corners and credit card sleeve. 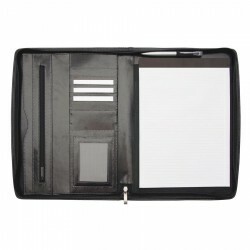 Quality leather outer - leather look inner, A4 lined pad - 50 pages, Dual powered calculator, 6 card holder, Inner storage sleeve and pen holder, Full zipper, Metal badge, Pen not included. Bonded leather. Scallop feature panel front and back of spine. Elasticised loop for pen inside spine. Slip pocket with business card holder inside left. A5 pad included. Bonded leather compendium with contrast stitching, side and top entry for notepad, full zip closure, multiple inside pockets, elastic pen loop, A4 lined pad, metal badge. Pen not included. This sharp looking portfolio set consists of a clean design leather ballpoint which perfectly matches the keoskin portfolio and key ring. This set is presented in a unique Balmain gift box. Stylish and made from top grade cowhide. 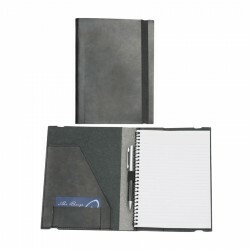 Features: pen loop, internal gusseted pockets, business card holders and A4 lined pad which inserts from the side. Pen not included. Black bonded leather folder, Brushed silver badge, A4 notepad, pen loops, business card pockets, Optional dual powered calculator D980. 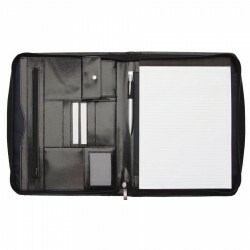 Black bonded leather, Brushed silver badge, 3 x 20mm removable snap rings, A4 notepad, pen loop, business card pockets, Optional dual powered calculator (D980). 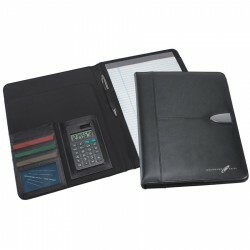 Black bonded leather spine & microfibre front, A5 notepad, pen loop, inside pockets, Includs silver dual powered calculator, Supplied in black gift box. 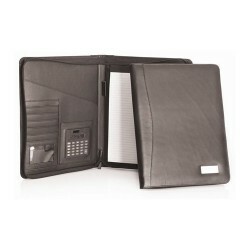 Black bonded leather spine & microfibre front, A4 notepad, pen loop, business card & inside pock, Includes silver dual powered calculator, Supplied in black gift box. 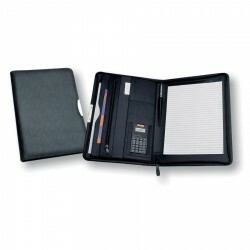 Black bonded leather spine & microfibre front, 3 x 20mm removable snap rings, A4 notepad, pen loops, inside zip pocket, Includes silver dual powered calculator, Supplied in black gift box. Pad cover manufactured from full grain leather and supplied with a writing pad. Features: Features pen loop, A4 lined writing pad which inserts from the top, business card holder and internal gusseted pocket. Pen not included. Manufactured from full grain leather with contrast stitching. Features: Features business card holder, 3 pen holders, zippered pocket, 5 credit card pockets, 2 internal pockets and A4 spiral pad which inserts from the side. Fits iPad Holder 9118. Made from koskin leather-look material with zipper closure. Features: Features include zipper closure, pen loop, internal pocket, solar calculator and A4 lined pad which inserts from the top. Pen not included. Metal badge engraves Champagne Fits an iPad in the left side pocket. 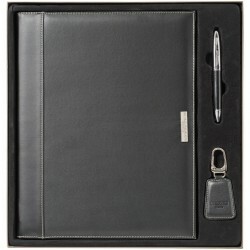 This quality Leather portfolio is ideal for the stylish executive. It features Quality Leather finish, Micro-fibre and Leather inner, Brushed Silver accent plate, 8 digit solar calculator, Note Pad, Pen Loop and Business card pockets. Pen additional. Black premium quality top grain leather. Includes multi-use inside pockets, pen loop, outside pocket on back and A4 Pad. In black gift box. (Pen not included). Soft cow hide A4 covered lined pad pen loop multiple card pockets accepts landscape A4 pad. Note this product is not a stock item it is made to order and minimums apply.